The most efficient meeting is: no meeting. There are a lot of meetings that could be avoided by a written report, questionnaire, poll or any other means. If you want to get an answer to a question, it may be wise to try researching for answers available on the Internet. First of all, you should ask yourself if you could avoid the meeting altogether. If you cannot avoid it, then you should prepare for it. Type (information sharing, decision-making, problem-solving, planning). Agenda – a short list of topics that will be discussed. Preparation materials – participants are expected to read that so that they can come prepared. Duration (15min, 30min, 45min, …). First and foremost, before organizing an efficient meeting, you should define the type of the meeting. If the purpose is information sharing, you could end up just writing an email. In case of a decision-making meeting, you should make sure that key decision-makers are required participants. For the problem-solving meetings, the key participants are the subject matter experts. And if the purpose of the meeting is planning, you need to share a draft of the plan in advance in order to make it an efficient meeting. The next step is to define and invite the participants. Be very careful when selecting the required participants, everybody else is optional. Use both options of the meeting invite and respect everybody else’s time. When you are sure which participants do you need, then send out the invite as early as possible. Cancel and/or postpone if key required participants cannot make it. And last but not least, follow up with required participants a few days before the meeting to make sure they have now missed the invite. Defining the duration of the meeting is mostly a gut feeling. Efficient meetings take as much time as needed to produce the expected results. Do not be afraid to use the 15 min and 45 min options and not only the 30 min and 1 hour options. Duration may also depend on availability of the required participants. Split the meeting in two (or more) if the different decision-makers are required in different time periods. List the purpose of the meeting in the invite. Include as much information as possible, but clearly mark the parts which are important. You can even attach optional details as a document. Clearly state that all participants should read the important information to make sure they come prepared. Every efficient meeting has an agenda. The agenda consists of goal statements and a list of discussion topics that will be covered. Every agenda item should have a presenter or owner. Do not be tempted to write too much for each topic. Use numbered lists instead of bulleted lists. Use sublists with subtopics to provide more details. Try to estimate the duration of each topic. List it in the agenda. It is ok to change or update the agenda. Make sure that all participants receive the updated agenda. Allow the participants to comment on the agenda. Allow them to add items. Do not forget to recalculate the durations. Print out the agenda several times and have it with you on the meeting. List the conference information (dial number and meeting id) somewhere visible around the agenda. Just like every capable commander, the organizer of an efficient meeting should go and examine the meeting or conference room. Picture yourself hosting the meeting. Pick a comfortable location. Test the equipment, if possible. Anticipate the locations of the important participants and try to guide their choices. On the day of the meeting, arrive early and setup the equipment. 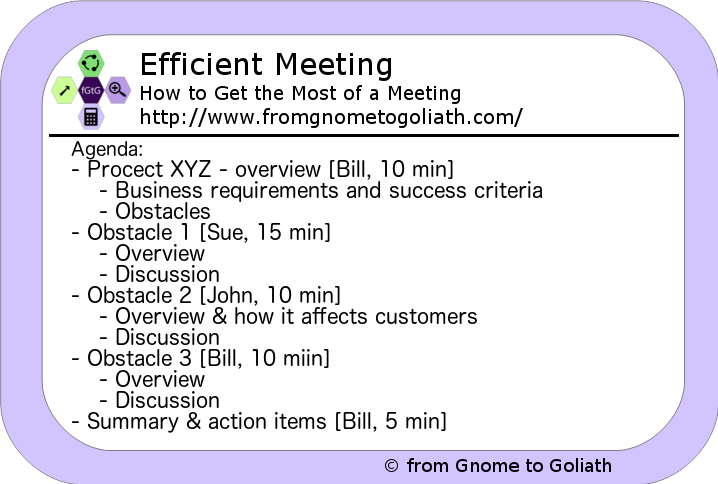 The second step of the efficient meeting is how you execute it. You have printed and distributed the agenda, the key participants and decision-makers are present. Now it is up to you to reach the goal that you set for the meeting. First of all, start with an introduction. Keep it short, but to the point. If needed, introduce the participants. Then, set and manage expectations. State clearly what is part of the meeting and what is not. Either keep notes, or designate a notes taker. Use an open body language to allow the participants to relax. Start going through the agenda topics. When the agenda topics are covered, close the meeting with summary and list the action items. At the end, discuss possible follow-up sessions if needed. The efficient meeting has clear expectations and the organizer should re-iterate them in the beginning of the meeting. For example: “W are here to cover X, Y and Z and not M, N and P.” Ideally, you should have prepared the topic owners in advance. If not, you could use this time to arrange what you expect of them during the meeting. Keeping notes is one of the most important jobs during an efficient meeting. Ideally, the notes taker should not be part of the meeting or emotionally involved in the decision or outcome. If this is not the case, it is better if somebody else takes the notes. And last but not least, if you have to do it, try to be as detailed as possible. But do not lose yourself in notes, so that you miss something important from the discussion. Using notations like a question mark for topics for research, exclamation marks for action items, or anything else that would help you remember is extremely useful. The note taker should track action items separately. You should generally prefer paper as humans prefer to writing on a paper and writing on a computer can distract them. I have also seen high-tech companies, where writing on a laptop is accepted and quite common. The most important job of the meeting host is to keep the discussion on track. Everything else is not an efficient meeting. Do not be afraid to interrupt people and steer them back to the topic. Have a bucket for topics to cover offline. Usually, such topics require a subset of the participants. Do not let the discussion continue forever. Remind the participants to obey the time limits. If you cannot reach a decision, end the meeting and schedule a new one. Do your homework in advance and anticipate potential unproductive conflicts. If you had an efficient meeting, then you will have a list of action items, detailed notes and decisions for follow-up meetings. Your first job after the meeting will be to compile the notes into “meeting minutes“. This is a document that describes the discussions, action points and follow-up decisions of a meeting. After you compile the meeting minutes, send them to all participants (even the ones that were optional and did not attend). Start with a “thank you for your attendance” sentence. After all, they all spent some of their valuable time on your meeting. Just like the agenda, try to be as brief as possible. Fist of all, list the date of the meeting and the participants. Then, list the title of the meeting (in the email subject) and the topics discussed (in the body). When was left for future meetings. Lastly, list the actions items. Add dates to each item. If a date was not including try to drive the dates yourself, but be careful and expect retaliation. Add owners to each item. 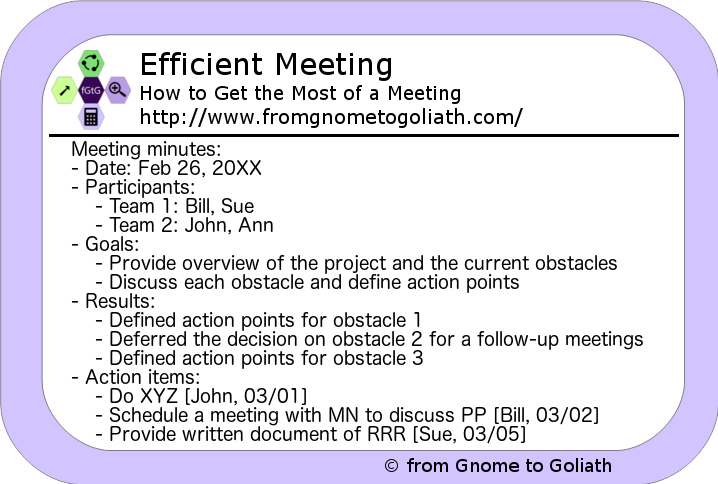 After you have sent the meeting minutes, start tracking the action points and the outcome. After a few days send a follow-up email scratching the completed action items and updating the rest. Be present. Do not use your laptop, or if you need to use it do not attend the meeting. Listen actively and show it using body language, nodding. Be polite, but firm. Do not let other force decisions upon you. It is ok to interrupt and ask for clarification. Especially if you are a decision-maker. Minimize distractions. Switch off your phone. Hold the organizer accountable to the agenda. Make sure that they follow it. Having efficient meetings greatly increases the trust in yourself as organizer and in your organization as a professional unit. Stating the purpose of the meeting, following the agenda and reaching the desired outcome, contribute to the success of the organization. Making sure that action item owners complete their assignments after a meeting is very important for the credibility of the organization and your personal contribution. By reducing the unnecessary meetings, decreasing the duration of meetings and increasing the efficiency of meetings, you can reduce the cost of meetings in your organization and increase the success and the financial results. And lets not forget, meeting are a $37 billion market in the US.